As an entrepreneur who works from home, I’m embarrassed to say showering during the week is sometimes optional. But when it comes to my nails, I simply can’t function without picture perfect, freshly polished tips. Since sheer pink shades make my pasty white skin look even more sallow (particularly given Gotham’s grime), I stick to darker, more luxurious nail lacquers. 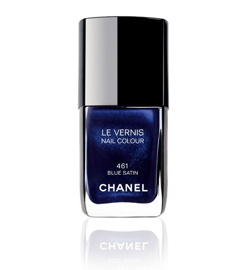 Rather than continue to sport last year’s witchy Halloween hues, I’m jumping in on the blue bandwagon… as in Chanel’s Blue Satin. In case you haven’t already heard, the mood for Spring ’08 is shifting to blue. Following the success of last year’s coveted Black Satin polish comes the arrival of Blue Satin – a deep cobalt hue that’s been flying off the shelves of cosmetics counters since debuting earlier this month. Spotted on les mains of models at Chanel’s recent RTW runway shows, Blue Satin’s long-lasting formula, not surprisingly, is already infiltrating the fashionable streets of Manhattan. It’s day three of my first Blue Satin manicure (I snagged one of the last bottles at NeimanMarcus.com) and I’m pleased to report that I still don’t see any chips. Another cool thing about Blue Satin: it’s like having two sultry shades in one. During the day, the indigo shade emits a subtle glimmer, whereas after dark, it turns an intense twilight hue. Another added benefit: the goof-proof handle and extra-wide brush glides on easily, making it a cinch for at-home touch-ups. But at $19 a pop, you’d better use your supply sparingly. Buy some now before it’s out of stock – I’ve already seen some listed on eBay for double the price! P.S. Can’t get enough Fashion Junkie? Check out the new iVillage.com “Steals & Deals” blog. Tune-in daily for expert shopping tips and irresistible insider bargains brought to you by yours truly. Happy shopping! Thanks to weeks of gorging on greasy pizza, red meat, chocolate truffles, red wine and Stilton cheese (gotta love the holidays), my digestive system is desperate for a tune-up. Rather than flush out my toxin build-up with several heaping bowls of Super Colon Blow (a.k.a. Fiber One), I’m kick-starting my New Year’s with Boots’ Feel The Difference 5-Day Detox Plan – a more intense yet palatable total body cleanse. A strawberry-flavored liquid that won’t make you hurl like those Milk of Magnesia products, Feel The Difference (FTD), when used regularly, will magically cleanse, purify and revive your body from the inside out. Formulated from a blend of Grape Vine Leaf and Marine Pink Bark, two antioxidants that naturally flush away impurities from the skin, liver, kidneys and digestive system, FTD is a healthy and hassle-free way to put your system back on track. Another active ingredient, Schizanda, a strange-sounding herb that promotes liver cleansing, helps neutralize potentially damaging toxins such as pollutants, alcohol, smoke and even pesticides (eek!). Ready to join me in taking on the new year with vim and vigor? 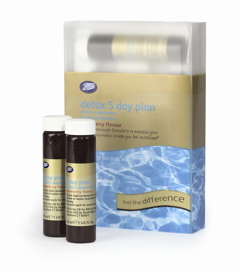 Simply add a 30ml dose of FTD to a litre of water every morning and, in a matter of days, you’ll look and feel completely revitalized. Just make sure to avoid processed foods, caffeine, cigarettes and alcohol, and just about any other vice you can think of, as they’ll interfere with the detox. If this doesn’t work, its back to bran! While baldness runs in my family, it typically affects the men, like my older brother, father and grandfather. At least that’s what I thought ‘til I noticed clumps of my curly hair recently clogging the shower drain. Since I’m technically still of childbearing age, I can’t use those chemical-laden hair-stimulating shampoos like Rogaine. 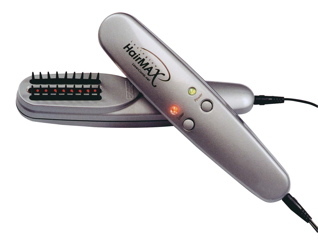 And because I refuse to wear a wig or a blue rinse until I retire to Del Boca Vista, I’ve found the next best alternative – the Hairmax LaserComb. Far safer and superior than those pricy prescription lotions, potions or pills, the LaserComb is the only FDA-approved DIY laser therapy, hair-growth treatment. A lightweight, hand-held gizmo with an easy-to-grip ergonomic design, the LaserComb works by stimulating scalp cells with a low-level laser beam for thicker, fuller and healthier hair in a matter of weeks. Ideal for girls on the go, LaserComb comes equipped with a sleek leather carrying case and universal power supply, making it handy for overseas trips. The hidden value: it even helps control severe dandruff (who knew?). With a lifetime commitment of only three times a week for 10-15 minute sessions, LaserComb is about as routine as brushing your teeth. Activate the high-tech tool by plugging it in and slowly glide the comb-like teeth across your scalp at 4-second intervals. Go against the direction of your hair growth, starting from front to back and then bottom to top. Once you start treatment, you should begin to see dramatic results in as little as 12-16 weeks. Buyer beware: once you stop using the LaserComb, your hair will gradually revert back to its original thinning state. While a price of $545 may make some of you want to pull your hair out, with a lifespan of 10+ years, LaserComb may well be worth the investment. Building a website is not unlike building a wardrobe. You constantly have to balance form and function while keeping the look fresh, not dated. Since you don’t get a second chance to make a first impression, MacroBlu – a hip Toronto-based boutique web design firm, can give your business the facelift it deserves this New Year with a fabulous new website. Looking to generate some online buzz about your new clothing label but don’t have a clue where to begin? Don’t sweat it! MacroBlu’s team of tech experts will help you build a functional and fashionable website with all the nuts ’n bolts and bells and whistles. From full-blown shopping sites with e-commerce, interactive personal blogs, ongoing maintenance, slick graphic design, email newsletter campaigns to ad banners, Macro Blu can do all the legwork. Plus, the friendly staff will hold your hand throughout the entire development process – a rarity in the web industry. With an impressive client roster that spans the globe, MacroBlu can seamlessly work with you, no matter where you’re located. Take a look at MacroBlu’s latest masterpieces such as Sample Studio, Admiral Road and Stillo&Purritt. They’ve also created edgy interfaces for jewelry designers such as RitaD and Basia, cool clothing stores like 119 Corbo, Accessity and New York’s own C-IN2, Meg Shops and Actex Menswear. With over 200 fashion, beauty, health and retail-related projects behind their belt, you’d be foolish to build a website without MacroBlu. Exclusive Deal Just For YOU! MacroBlu is giving Fashion Junkie subscribers a special 15% discount off any web design services of your choice if purchased before January 1, 2008. Call 416-927-0432 and quote the promo code “MACROBLUJUNKIE” to receive your discount.